About Us - Brite Line Parking Lot Striping | Brite Line Paint Co. Inc.
Brite Line Paint Co. Inc.
Brite Line Paint Co. Inc. provides professional pavement marking services to customers primarily in Massachusetts and Rhode Island, as well as in Connecticut, Maine, Vermont and New Hampshire. We specialize in commercial parking lot layouts, parking lot striping and re-striping. Additional services include the installation of parking space bumpers, handicap parking signs and asphalt renewal services, such as professional seal coating and crack filling. It is our attention to detail and strong work ethic that have helped to make Brite Line Paint Co., Inc. such a success throughout the northeastern states. We have provided services to large shopping malls, high schools, hospitals, mini malls and other commercial properties. Our many years of experience give us the unique ability to effectively design commercial parking lot layouts, giving our clients access to the maximum potential for parking spaces, while ensuring that lines are painted correctly, according to local, state and federal law. 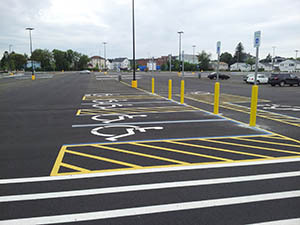 In addition to commercial parking lot layouts, striping and re-striping, the additional services that we provide, such as parking space bumper and handicap parking sign installations, help our clients to meet local safety laws and regulations. We stay on top of laws pertaining to the number of handicapped parking spaces that are required for a client, based on the Americans with Disabilities Act federal mandate, to ensure that adequate parking is provided for disabled customers. This includes the overall layout of the parking spaces, proper use of handicap parking signs, accessible spacing and van accessible parking requirements. To find out more details about the pavement marking services available through Brite Line Paint Co., Inc., continue browsing through our website or give us a call at (508) 678-6775. 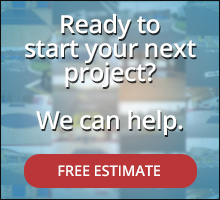 You can also get a FREE ESTIMATE by filling out the information request form on our website. Copyright © 2019 Brite Line Paint Co. Inc.